Sergio Garcia has over-corrected himself. Having hooked a tee shot left into the Outer Hebrides last time, he's now gone and sent his next one miles right. Rory McIlroy is one understanding golfing partner. Henrik Stenson with a superb shot towards the ninth green that just trickles off the far edge. It was a brilliantly judged shot through the wind, which is causing havoc this afternoon. It's short from Rickie Fowler, and the Europeans move back to 1-up. A magnificent putt from Sergio Garcia - one of the longer ones we've seen holed today. McIlroy congratulates him and that makes up for his tee shot at the previous hole. The US will have a putt for the halve. Mickelson does it again! His short putt horseshoes at the fourth and stays out, and that moves McDowell/Dubuisson 2-up heading to the fifth. Amazing how often that happens to Lefty. No mistake, however, from Jimmy Walker and he levels the match against Garcia/McIlroy. Keegan Bradley misses a putt for the win against McDowell and Dubuisson, and that match remains with the Europeans at 1-up. Graeme McDowell leaves a putt short. In his blue wind-breaker and white hat, he looks like a Smurf. Justin Rose misses a tricky little tiddler, and it's back to all square after eight holes against Mahan/Johnson. Garcia/McIlroy are on the green in four, and Rickie Fowler knocks it safely on to the green in three. Would be a halve "against the head", to borrow a rugby phrase. Europe are making an utter pig's ear of the fifth, and yet it's not out of the question they could get them a halve. Again, beauty of matchplay. Jamie Donaldson narrowly misses again with a putt at the ninth, it's a halve in five, and Europe are 1-up going into the back nine in the first foursomes match. And Mickelson not only matches it, he betters it! Super golf from both sides. Victor Dubuisson hits a worldy at the third. Europe in pole position on that hole now. Or, as us Scots know it, summer. Considering this is essentially two-ball golf, the pace of play is diabolical. Just saying. Honestly, this was even worse than Poulter's top into the lake at the ninth this morning. And Webb Simpson's very first shot of the day. Would love to have seen Rory McIlroy's face as it happened. "Gee, thanks partner..."
Wow. Sergio Garcia at the fifth tee hits a snap-hook. That's the worst shot of the day, no question. Absolutely brutal and never mind out of bounds, it's out of Perthshire! That, sadly, won't update automatically. Hit refresh and it should be all good. Please update the board on the side!! Thanks! USA!!! It's all blue, but don't get too excited, European fans - every match is 1-up. That's a very slender margin in something as erratic as foursomes. Dubuisson and McDowell move 1-up on Bradley and Mickelson, and the board is entirely blue. Middle of the hole, what was the fuss about! Zach Johnson has a putt to move to 1-down in the Stenson/Rose match. They are taking an age to decide the line on this, which doesn't reek of confidence. It is enough, and Europe are 1-up in that match. Garcia teases his putt at the third up the hill, and that should secure the hole for Europe. Jamie Donaldson just misses the edge of the cup on the eighth, but it's a halve and he and Westwood remain 1-down. Rickie Fowler thins his chip at the third back across the length of the green. They're likely to lose that hole as things stand. America has the advantage at the seventh after Justin Rose fails to match a superb approach by Zach Johnson. The USA needs something soon in that match. Thanks Rasmusbach - have done so. Is there any way to unflag/unsticky that top post? I really don't need the pairings at the top seeing as they can be found just to the right of the chat window. I'm currently in distress, not only are Europe down but I am at work eating fruit.. think I need a beer or two to cheer me up! Jamie Donaldson has had a taste of Ryder Cup pressure for his. Misses a halve-putt at the third and Furyk and Kuchar go one up. Prepare yourselves for a tight one this afternoon. What's everyone having for lunch? Steven's gone for a sausage roll. What about Team USA, how are you celebrating your morning lead? Champagne? We can't keep relying on Lefty and two footers. GO USA!! Well, well, well - who would have predicted that morning? What drama. 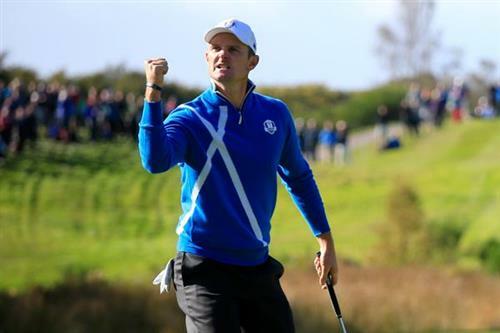 Europe will be hoping to hit back in the foursomes while USA now have a lead to build on. The foursomes this afternoon are going to be hard to separate, but hopefully Europe can pull a point back to make it a tie! Now, it's time for that square sausage roll I mentioned. Leading you into this afternoon will be Rob Bartlett. Two matches went down the last, USA won the hole each time. That is a huge concern for Europe going forward. The USA emerge from this morning's session having been on the rough end of things for a long time but with a one-point lead. That's a success, no two ways about it. Work for Europe to do. And watch the crowd start playing their part, too.